An early view of Lake County House. In 1871, not long after John Henry Berry built the first house where Middletown would grow, his brother-in-law, Charles Marsh Young, bought it along with Berry's fifty-percent share in the surrounding 80 acres and tore the house down. Young promptly replaced Berry's four-room frame structure with a 14-room hotel and named it the Lake County House. It became a landmark for the next several decades. The hotel was so popular that Young started his own brickyard and replaced the original building with a solid structure that survives yet today, although its signature veranda burned in the infamous Middletown fire of 1918. Young had also taken over Berry's partnership with Oscar Armstrong, and the two of them contracted with B. R. Wardlaw, who had established a reputation with his surveying and platting work in the Sacramento area. Wardlaw's platting started in 1872 although his map for Middletown was not formally filed until March 4, 1878. History books tell us virtually nothing about Oscar Armstrong. Census records show him living with the family of William J. Armstrong, either a brother twenty years younger or a nephew. County Recorder's data show him buying and selling properties in the Lower Lake area several years before he showed up in Guenoc as a saloon keeper before 1866. Oscar died in June of 1872, and his widow, Mary, continued as Young's active and able partner, selling lots and engaging in the other enterprises incidental to starting the town. By 1874, Middletown's population tallied 128 males and 79 females. Many had been residents of Guenoc. Armstrong Street and Young Street parallel Main Street in Middletown. C. M. Young and his wife Margaret Lutitia were among the most noted and ambitious of Middletown's first settlers. Theirs was one of the parcels recorded among the first sales of Rancho Collayomi properties on Sept. 28, 1870. The couple were married in Sebastopol November 20, 1866, and shortly afterward moved into Lake county. They arrived in Coyote Valley January 18, 1867, and leased a plot on the Rancho Guenoc grantlands. In Middletown's early years, the Youngs owned not only the hotel but a livery stable he had built in 1873 at the other end of the block, a general store started by the two eldest of their three sons, Wirt and Baxter, and a meat market. Young had built a comfortable residence on Young street in 1872, which remained in the family until Margaret's death in 1934. Both Charles and his wife participated actively in the operation of the hotel, Margaret proving to be a gracious hostess. The elder sons were respected as businessmen, the youngest,Charles William, starred on Middletown's baseball team and in its community band. In 1885, Young traded the hotel to John McGreer in exchange for the old Stone House and its 960 acre ranch. About 1892 Young bought the general store Wirt and Baxter had started, carrying on the business until burned out in 1894. He had no insurance, and the $4000 stock was a total loss. When the store burned he went back to the ranch. There he gave most of his attention to agricultural pursuits, though he held the office of supervisor for six years. He was first appointed, by Governor Stoneman in 1890 to fill a two-years' vacancy, at the end of this service being elected for the full term of four years. He also served as county assessor (1902-06). 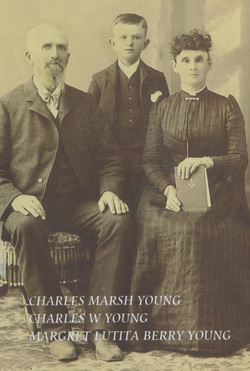 November 20, 1866, Charles Marsh Young married Margaret Lutitia Berry in Petaluma and the young couple promptly settled in Coyote Valley, in or near the village of Guenoc. History refers to Mrs. Young both as Margaret and as Lutitia. Margaret was a force in the social life of the community. While still living in Guenoc, she and her sister Lamira, wife of W. G. Cannon, initiated the first church in the community in 1867, a Presbyterian congregation that met in the old Stone House in Coyote Valley. Margaret was a founding member of the Ora Fina Rebekah Lodge . She and her brother John were active in the Independent Order of Good Templars, a temperance group that was very strong in Lake County and elsewhere at the time. farm work otherwise. He began to plow when only eight years old. In 1863 he set out with teams for California, coming across the plains with teams, but stopped in Carson valley in Nevada for five months. In January, 1864, he came to San Francisco but immediately returned to Illinois, via Panama, on receiving word that his brother, William A., had just been discharged from the army, badly wounded. were creating great excitement at the time. At Bridger's cutoff they separated, William continuing on to Idaho. Charles located in Sonoma county, where he rented a place and farmed two years. Margaret Lutitia Berry was born March 27, 1845, at Fulton, Ill., daughter of Baxter Bell and Elizabeth Cameron Berry, the father a native of Tennessee, the mother of Kentucky. Mr. and Mrs. Berry moved to near Oskaloosa, Iowa, and from there came overland to California with the Purvine Party in 1852, settling in Sonoma county. Of their nine children only three had survived when the History of Mendocino and Lake Counties was published in 1914: Lamira S., Mrs. W. G. Cannon; Margaret Lutitia, Mrs. Young; and Eva, Mrs. Scudder, a resident of Sebastopol, Sonoma county. Four children were been born to C. M. and Margaret Young: Wirt Haight, Baxter Ewing, Lizzie, and Charles. Wirt Haight, in 1914, was engaged in farming in Coyote valley. He had married Lizzie Hughes, and they had two children, Ethel May and Wirt Raymond. Baxter Ewing, located at Oakland, Cal., married Miss Hattie Adamson, by whom he had one child, Margaret Lois. Lizzie M. died when about three years old. Charles W. worked in Sacramento, engaged as foreman in the reclamation of lands along the Sacramento river, in the employ of the California National Bank; to him and his wife Velma (Brooks) were born two children, Charles Glenn and Lutitia Adeline. Much of our knowledge of the Young family has been contributed by a granddaughter of Charles Glenn Young.